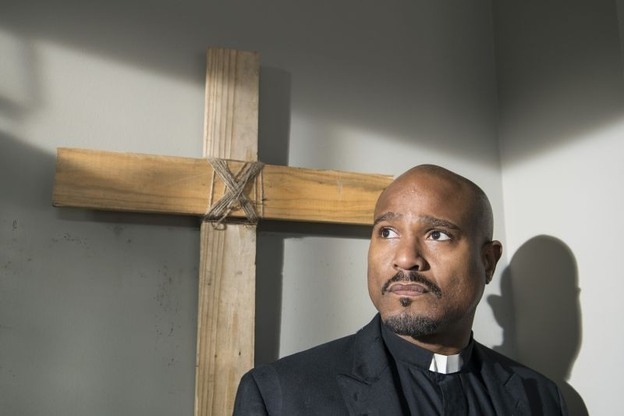 Father Gabriel enters into the empty house of worship and slowly makes his way up to the podium. Struggling to be back in the church since having barricaded himself back in Georgia, he stares at the bible and a note from Rosemary thanking him for his arrival sitting next to a batch of strawberries. He slowly starts tearing out the pages and slams the book shut, staring upward as if to check to see if God will strike him down. Noah decides to meet with Mr. Monroe early one morning. Not sure why they are meeting, Noah unveils that he wishes to learn the construction trade. Though a little hesitant at first, Monroe jots down some notes and hands the notebook over to Noah, asking him to start recording what he experiences as well as what he learns from Monroe. He meets up with Eugene to learn about what they need to find on their mission outside of the walls. Aiden Monroe gets the group together and checks in with his parents, just as Glenn kisses Maggie goodbye. As the van pulls away, Gabriel peaks out on the scene. Rick stops by to see Jessie fumbling around with her broken owl statue. He jokes a little with her as he volunteers to find the person responsible. Carol is surprised when Sam sneaks into her house and demands cookies. She refuses and starts to push him out. He continues to beg, so she gives in and tells him that he has to steal the chocolate. He returns later and shows her the chocolate. He continues to push her to open up, but he actually reveals that he broke the owl statue he worked on with his mother. He asks about the guns, and Carol replies about needing to protect herself. Sam asks for one of the guns, but says that it is for someone else. Later on, she walks over to Sam’s house and talks to Pete to check on Sam and Jessie. Carol goes to see Rick and report that she is concerned about Pete. Abraham finds himself outside the wall working to expand the wall. One of the workers runs off for a few moments and leaves him at the work truck. The pressure starts to get to him after so much time in survival mode. Suddenly, walkers appear out of the woods. The group struggles to shoot them down. Abraham runs up and saves Francine but finds himself surrounded on all sides. He slides under the tractor to get away. 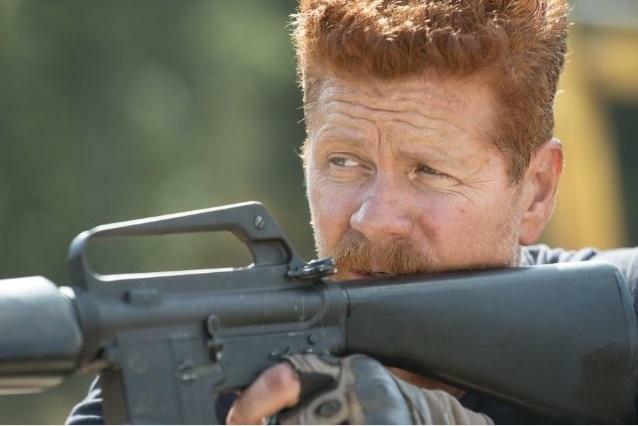 As Francine helps him shoot, Abraham starts walking away with a hammer, killing walker after walker. Abraham finishes the fight and argues with the crew for leaving her behind. He takes charge and commands the group to continue working on the wall. Tobin goes to see Deanna to ask her to make him the crew chief for the construction. Maggie sits in on the conversation and vouches for Abraham’s credentials. Deanna is concerned for all of Rick’s group getting positions of power, but Maggie convinces her to stick with the decision. Rick invites Pete over to talk about the broken owl statue, letting him know that he was not able to find anything. Pete mentions that he knows about Rick’s wife and starts to talk about having lost some things himself. He offers checkups for his kids, asking for them to be friends. As Pete leaves, Rick stares out the window and plays with his ring for a moment. Gabriel goes to speak with Deanna privately. He goes on to put doubt in her head with Maggie listening in the shadows. He claims that Rick and his people are dangerous. He believes that Rick’s group will destroy everything. Deanna thanks him and says that she has much to think about. Just after he leaves, she hears shouting. As Carol talks to Rick about Pete, she believes that he will have to kill him. Review: After a few calmer episodes to start the group’s time in Alexandria, the intensity level has risen significantly. Including a grenade explosion, multiple walker attacks, and the first human death in several episodes, there must be something big coming at the end of the season. Doubt is starting to build for Deanna. Power is shifting in the community in just a short time of Rick and his group being there. With Glenn surviving instead of her son on the supply run, Abraham taking over at the wall construction, and Maggie playing her influence directly with Deanna, Gabriel’s words at the end of the episode set up the opportunity for Deanna to turn on her newest community members. It is clear that Rick’s group is built for survival while Deanna’s is trying to live comfortably. Alexandria is a soft community and has the potential for a real tragedy coming soon. Aiden and Nicholas were not prepared to defend themselves, and neither were the crew members working on the wall. Whether that will be because of Rick or in spite of his arrival will be interesting to see. Eugene, Abraham, and Noah had true step up moments. While Abraham has shown power and initiative before, he almost single-handedly saves Francine and the crew, even going with more physical combat. This was enough to convince Tobin to lobby for his leadership with the construction moving forward. When Glenn and the group got to the warehouse, Noah immediately showed off his marksmanship, taking out one walker with a headshot and several inside the building as the chaos went down. Eugene showed both sides in the warehouse. He was initially stricken by fear, but with the safety of Tara in the balance, he stepped up, fought his way out with her on his shoulder, and lured the walkers away from the door when Glenn, Noah, and Nicholas were trapped. He did not even want to go in the first place, but it was a good thing that he did…even if he could not save Aiden and Noah. The loss of Noah meant something important to the show. He was only with the group for a short time, but his interactions seemed to be followed by moments of death. Beth died in the exchange that would have sent him back to the hospital and Tyreese died when he tried to go back home on the travels toward DC. He tried to make sure that he would be a contributing and useful member of the group and this new society, which is why he took an interest in becoming an architect. His death was probably the most gruesome of the main character deaths so far in the show, literally getting torn apart while Glenn had to sit there and watch. And considering that Glenn had never been responsible for the death of a group member, this one will probably stay with him for some time. The episode ended with two big revelations and one significant question. Rick’s future encounter with Pete is coming. Carol’s awareness for something wrong with Sam and Jessie will certainly hit Rick pretty hard, especially with his potential romantic interest in Jessie. Gabriel has also betrayed the group. His scene at the start of the episode served as a moment where he was testing God. He tore pages out of the bible, expecting to be struck down. When that did not happen, he felt that God may have abandoned him and that Rick could be the reason why. 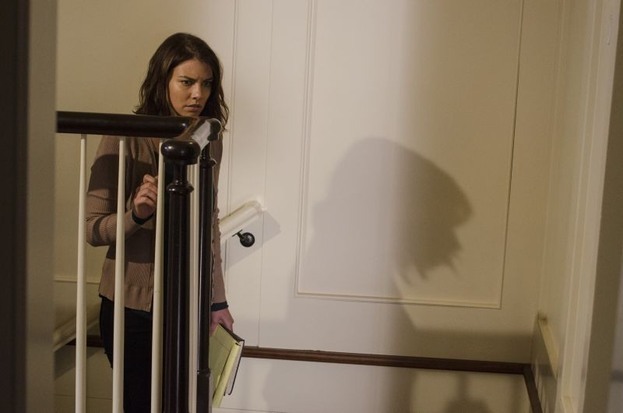 Maggie was listening in, so there may be another confrontation within Rick’s group before everything explodes with Deanna. This betrayal by Gabriel and all of the action of the episode will put Deanna in an interesting dilemma. Will she see through the chaos and understand that actions and decisions were rational attempts to stay alive or will she get caught up in the death of her son and shifting in the balance of power? Will she see Rick as a threat or continue to see him as a benefit to the community? Will she blame Glenn and Eugene for Aiden’s death and will Nicholas betray the people that saved him? “Alexandria is a soft community and has the potential for a real tragedy coming soon.” Possibly even several. Good recap and analysis. Noah’s death was indeed gruesome to watch and made worse by the fact that all Glenn could do was sit and watch. It’s a brutal moment compared to Bob and Tyreese just succumbing to their bites, while Beth and Dawn got quick deaths through bullets. Noah, however, watching him get torn to pieces was some scary stuff. That entire revolving door sequence was tense and well done, really. I think, like Bob, it may have been Noah’s optimism that foreshadowed his impending doom.